Denman Street is, like an other street, constantly changing. When the list of restaurants on the street was first written up back in July for this site, one place that didn't yet exist made it to the list - Kingyo. A sign in the window was announcing a soon to be open isakaya and so the info got written down without much thought given to it. Just an other isakaya, we thought. Were we wrong! Surprisingly, Kingyo is a big thing. When it finally opened, we learned that it's owned by the same people who have Guu and it soon became the talk of the town. 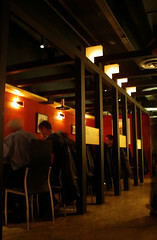 With great reviews right left and centre, Kingyo was named as one of Vancouver's top 10 (new) restaurants. So, of course, we wanted to check it out. When: Wednesday, January 17 2007. (7:45 pm plus some wait time). We thought that going on a raining Wednesday night would afford us a quieter experience but the place was full when we arrived. 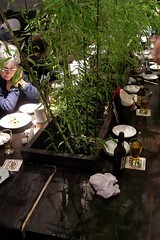 The atmosphere is fantastic, and the decor even more so - with live bamboo dividers and Japanese temple-inspired rooftops, it simply has to be seen. We say: The menu is quite extensive and filled with great items that rarely make it onto most restaurants' menus. Dishes are inventive and inspired - and hard to remember! M wrote down the name of the plates ordered and not their description, hoping for a web-based menu. 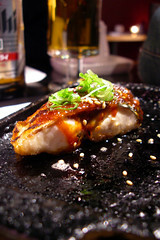 Unfortunately, with Kingyo not having a website, this review lacks in explaination of each dishes. M started with the Kingyo Cocktail ($5), a mix of shochu and sisho herb with a dried hot red pepper and tonic water. Nice and crisp, it's quite a refreshing drink. T ordered a large House Sake ($8). For food we headed for the Tebesaki ($5.40), chicken wings flavoured with sea kelp and special salts and the Grilled Pork Cheek ($6.80). 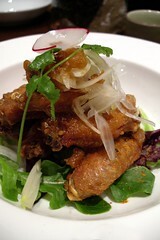 The wings did not taste as exotic as their description and felt like standard yakitori fare. The pork cheeks, on the other end, were delightfully tender and flavourful. 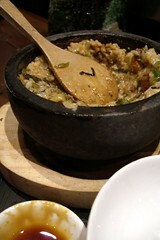 We then received the Stone Unagi Bowl ($8.80), a rice dish with unagi, pickles and other vegetables served with a raw egg that is hand-mixed at the table. The dish was more exciting based on the process than on the taste, but this is classic Japanese fare that reminded M of her travels in Japan. 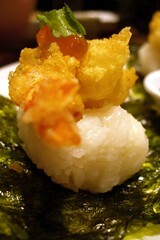 Next was the Ebi Tempura Rice Balls ($6.80). 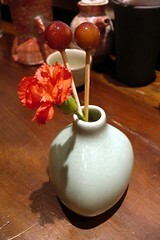 While we were expecting the Japanese-style rice ball, this dish was quite good in spite of being hard to eat. 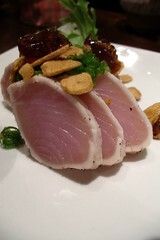 As the last dinner dish, we ordered the Tuna Tataki ($5.80), a seared white tuna sashimi with a yuzu jelly and dried garlic chips. 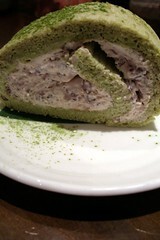 Dessert consisted of a generous slice of Green Tea Tiramisu with Red Bean Mascarpone filling ($4.50). This delightful fusion dish was a perfect ending to the meal. Pro: Despite our seemingly harsh criticism, We both thoroughly enjoyed this dining experience. 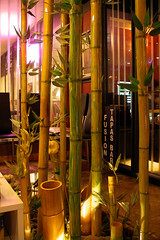 The decor, the atmosphere, the inventive food and the staff makes Kingyo worth the detour. Plus, they have some of the longest opening hours on Denman St.
Con: They could use some more comfortable chairs! Verdict: T says yea, M says yea. Image scan of Kingyo business card (c) Urban Mixer (Raj Taneja). Vancouver being plagued by wind storms, we didn't want to head out too far to eat. 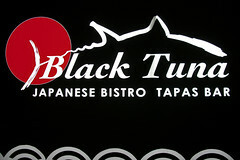 We chose to eat at Black Tuna because of it's proximity with home and because T was craving noodles. We say: Black Tuna offers a very solid menu - diversified, it contains inventive and creative items and ingredients, especially in the sushi roll department. 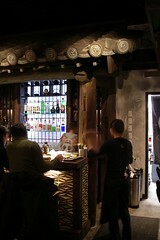 The restaurant positions itself as a Japanese Tapas establishment and this is reflected in the menu. There are a lot of small items to choose from, which makes it fun and easy to sample a wide range of menu items (and easy to go overboard, as we did). 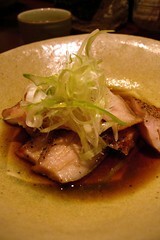 The first dish to arrive was a complimentary dish from the kitchen - a glazed mackerel sashimi served on a hot plate. It was perfectly cooked, tender and juicy and quite tasty. 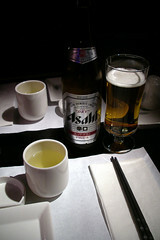 The dish worked quite well with our tall and pricey Asahi beers ($8.95). Then arrived our tempura selection. We chose Pumpkin ($1.95), Avocado ($1.95) and Squid ($3.95). The pumpkin was beautiful, simple and sweet, and the squid was perfectly cooked albeit a little flavourless. The avocado tempura was not quite as successful. While M enjoyed it, she did get the stub and T thought that it was too fatty and that the process caused the avocado to loose it's flavour. Next came a beautiful plate of sushi rolls. We picked two rolls: the Salmon Skin Maki Roll ($4.25) and the Dragon Roll ($8.95). M likes to order the salmon roll everywhere to gage the restaurant. This one was not as usual - it does not use BBQ salmon skin and is more on the spicy side. It was still nice, but not as good as the original version. As they say, if it ain't broke... 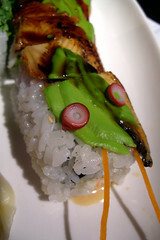 The dragon roll's presentation was incredible, with the roll decorated to resemble a dragon. We had heard that Black Tuna has their own roll creation, so we wanted to order a roll off chef Jacob's specials. 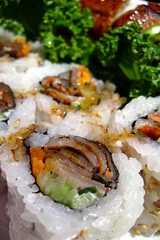 The dragon roll comprises of crab meat, cucumber, carrot, unagi, avocado and a Thai peanut sauce. While very original in its concept and presentation, the flavours fell short. It had too much mayonnaise and the peanut sauce was completely lost amongst all of the fatty items. To fix his udon craving, T ordered the Nebeyaki Udon Soup ($11.95). 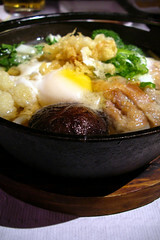 T felt that this was an excellent version of a classic Japanese udon soup. The presentation was again beautiful and the soup could easily make for an affordable complete meal. 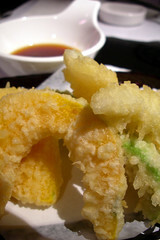 As an added bonus, the soup also comes with a Shrimp and Potato Tempura. While the potato was perfect, the shrimp was pretty tasteless. 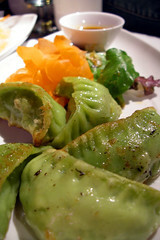 The hit of the meal was truly the in-house, hand-made Watercress Gyoza ($5.95). Packed full of flavour, the taste of watercress was never lost amongst the pork. The matching dipping sauce was also quite good. 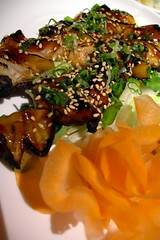 Lastly we had the Black Tuna Style Chicken Skewers With Teriyaki Sauce ($8.95 for 2). The teriyaki sauce was quite nice and not too sweet and you could still taste the chicken and the broiling through it. As well, the skewers had yellow pepper and shitaki mushrooms alternating with the chicken. This dish felt overpriced for what it is, but would work more as a main dish than as an appetiser. Pro: The gyoza are incredible and are worth the trip on their own. The extensive menu is great and every plate is beautifully presented. Overall, it was a fantastic experience and we really enjoyed it. A note on the service: it was attentive and good but it was the first time that we wondered why that was. Did we get the complimentary dish and the good service because we ordered a lot and that M was taking notes and taking pictures??? Con: The sushi rolls are clearly not their strong point. As well, a drink menu would have been appreciated. The restaurant could have use extra staff to ensure that the tables of departed guest were promptly cleaned up - some tables were had not been cleared when we arrived and were still not cleared when we left. To patronize at least once every establishment that serves food or drinks on Denman Street, in Vancouver's West End. Unless otherwise noted, all original material of whatever nature created by myself or by a contributor and included in this blog and any related pages, including the blog's archives, is licensed under a Creative Commons License.